Tonight I wanted something SPICY, but was also in the "Sunday" frame of mind... comfort food. Being an addict for shrimp... I thought: Shrimp & Grits! A nod to my Southern heritage. Living in Texas years ago I have a pretty good palate for hot and spicy. So here's the scoop: I took quick cooking grits (1 cup) and used chicken broth and the liquid from a can of Rotel tomatoes (3 cups total) too cook them in. Once I had the liquid measured, I added back the drained Rotel tomatoes. Delicious enough, right? Creamy. Spicy. Not good enough yet. Add 2 pats of butter and 1/2 cup of aged White Vermont Cheddar and a half teaspoon of roasted garlic grey salt (I get mine from NapaStyle.com). Then, the shrimp. I used a pound of large, peeled and deveined Gulf shrinp that have been marinated for a couple of hours in 1 T. of Vietnamese Garlic-Chili Paste - more or less to your taste, but the grits are going to be spicy too so.. tread lightly. Quick saute of 4 green onions, thinly sliced using only the whites and about 2" of the green ends, one Jalapeno, seeded and FINELY chopped in olive oil (about 3 T.) and butter (3 pats). Add the shrimp and saute FAST until pink on one side. Now here's the tricky part: flip em over, remove them from the heat, scoop them all in the center of the pan and cover. Let it sit for about 3 minutes and they will be PERFECT. Overcooked shrimp are not to be eaten. Ever. 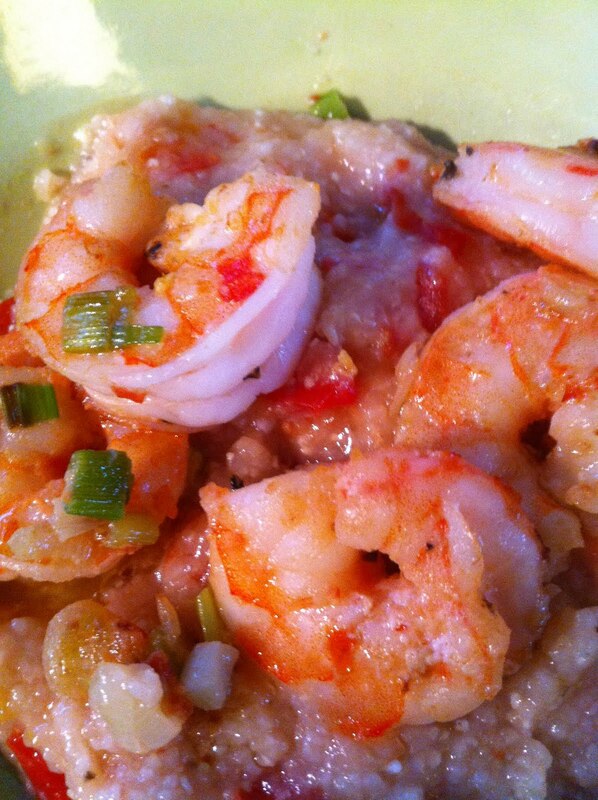 Shrimp and a little of the pan juices, served over the piping hot grits in a nice earthenware bowl? H-E-A-V-E-N! An ice cold beer is the perfect compliment. Go for it and let me know how it turns out.